Previous schemes 24 - photo gallery. MASSIF HOME EXTENSION WITHIN THE GREEN BELT - Here we analyse what can be achieved within the Green Belt. In this example we managed to triple the size of an original dwelling. By knowing what to do and how to select the 'donor property' in the Green Belt you do not need to be restricted to the councils Green Belt planning policy to just adding 30% to 50% of the original house floor area or volume. In this example 250% was added. Photo above:- A small 1930's 3 bedroom dwelling on a large plot within a very high value area of Surrey. Previously been extended that would have used up part of its house extension allowance under green belt planning policy. 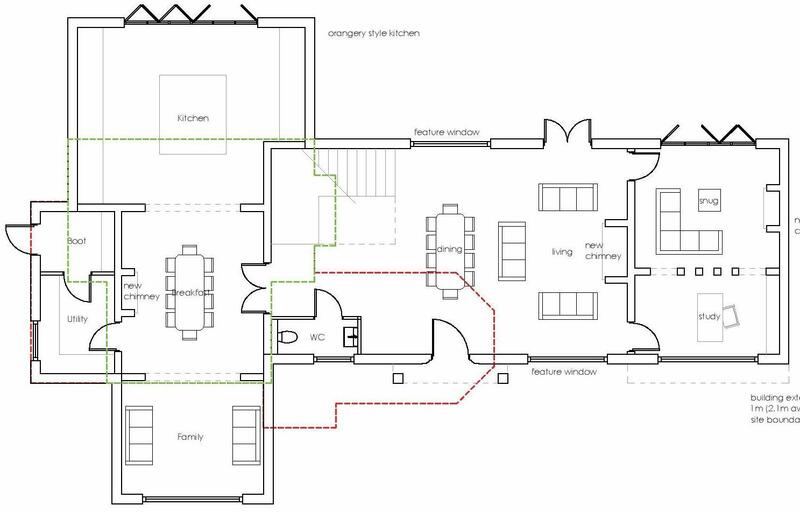 Photo above:- Proposed ground floor plan showing profile of existing property shown green and red. 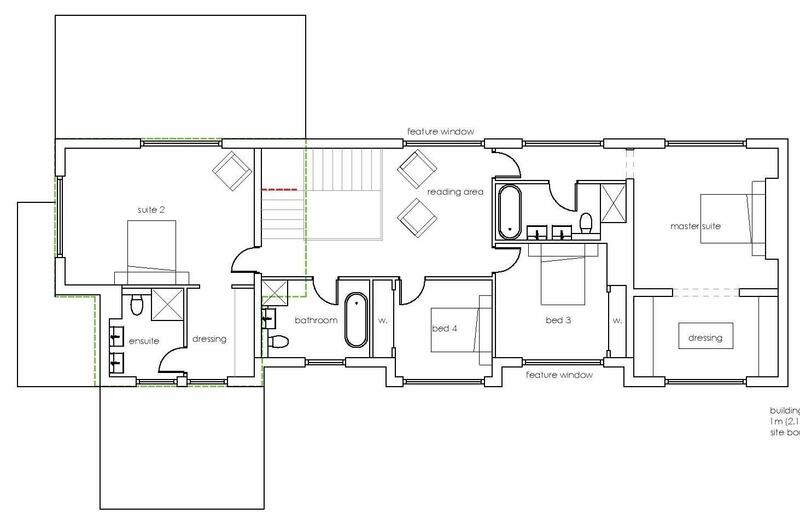 Photo above:- Proposed first floor plan showing profile of existing property shown green and red. Photo above:- Proposed front elevation showing profile of existing property shown green and red. 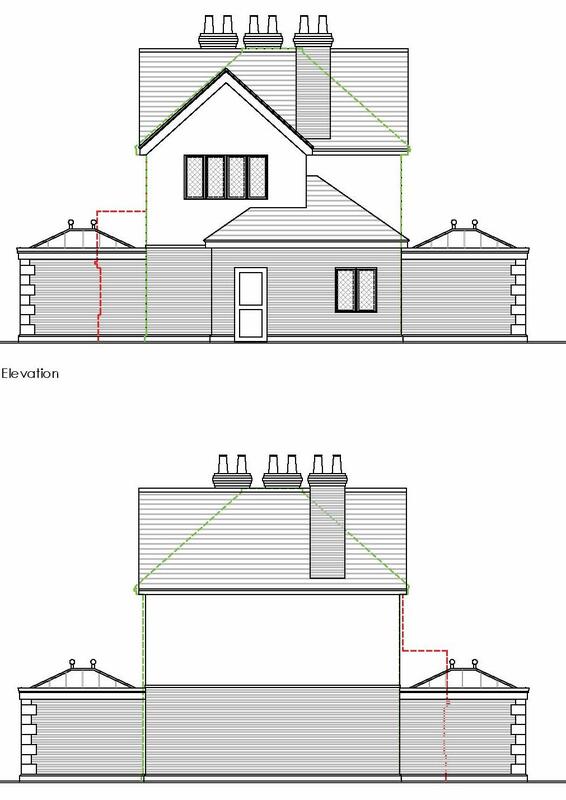 Photos above:- Proposed side elevations showing profile of existing property shown green and red. Photo above:- Artists impression of proposed front elevation indicating additional external treatments the client was considering for further character enhancements. Clients requirements:- To develop a property for maximum gain (floor area & value) within a tightly controlled location within the Green Belt. Normally this would be impossible but there are ways to do this if you know what to do. Planning Permission for maximising development opportunities like this is complicated and requires a tactical approach through the planning system with an expert (or two) if you are to be successful. CHP comments - This scheme is now under construction (as at September 2014) due for completion in Summer 2015. We can show you how to do this for yourself. Why not sign up for one of our one to one 'property developers master class' and within a few hours you to can be sourcing properties within the Green Belt for developing into huge homes. You can either select us to work with you to secure the relevant permissions or you can use the information and Knowledge gained to work with your own local design agent. This could be the best advise fee you will ever spend. You do the maths:- This donor property was purchased for £850k and was the cheapest on the road. Other larger properties values within the same lane range from £1.5m to £3m. The expected resale value of this property when extended is expected to fetch 2.8m+ for a build cost of around £500k. 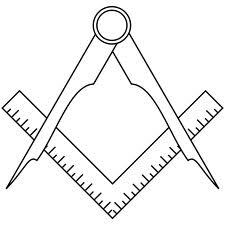 If you want to learn more about this service simply contact us for further details.